Many officials will not honesty help you. Remember “Psychology 101″ – Every human that comes in contact with you has an AGENDA…. That AGENDA is either good for you or bad for you. If it is a public official, you must assume that it is bad for you. THE LAW IS WHAT (1) PROTECTS YOU AS A PRIVATE PERSON AND (2) WHAT BINDS THE PUBLIC SERVANTS AND PUNISHES THEM WHEN THEY TRY TO CROSS THE LINE! START RECORDING!!!!! DON’T ANSWER ANY QUESTIONS!!! YOU ASK QUESTIONS! 1. What is your name and your employee number? 2. What is your official job title? 3. Are you in your official capacity at this moment? 4. Do you have a certified/notarized copy of your Oath of Office (as required pursuant to your state Articles/Statutes) which I may scrutinize? 5. Do you have a faith surety bond or any bond required of you to ensure your faithful performance of your duties, which I may scrutinize? Do you have any identifying information, policy numbers, and/or contacts that can provide further bonding information about you? 6. Are you required to uphold my rights specific to the 1st, 4th, 5th, 6th, and 14th Amendments as required by the united States Constitution, clearly established law, and your Oath of Office? 7. If you intend to question me, do you have a “release of liability from incrimination form” or the equivalent with you that I may review and sign? 8. 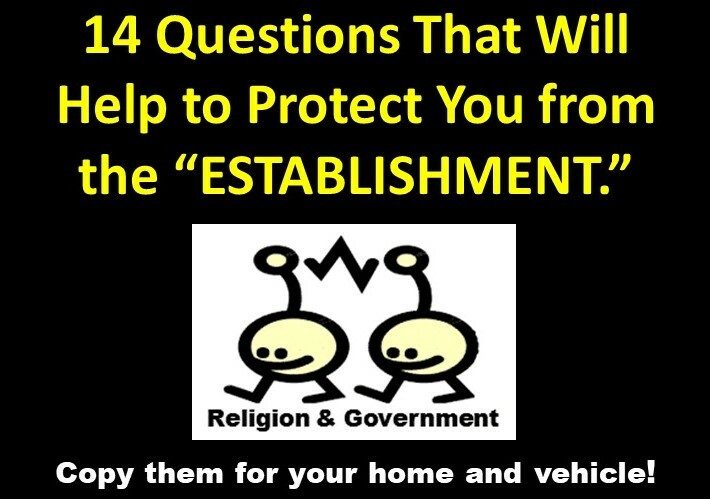 Am I required or compelled by any law to answer any questions that you ask? 9. If yes, will you please cite the law? 11. Am I being detained? For what? Am I free to go? 12. Has someone accused me of committing a crime? 13. Is there a sworn affidavit submitted on file from anyone alleging that I have caused them an injury? 14. Is there any constitutionally compliant warrant for summons issued that grants you lawful authority to be here or keep me here? May I have a copy? Use of recording devices encouraged! Remember, lawsuits may be filed in Federal Court when government officials violate your rights. File them by using Title 42 Section 1983 of the Federal U.S. Code. *The 14 Questions were retrieved from www.WeStudyLaw.org in 2013. Used with the permission of Fred and Nina Gutierrez of Las Vegas, NV.